Although most fruit beers are sissy at best, I toast 21st Amendment Brewery for this delectable/unusual flavor. 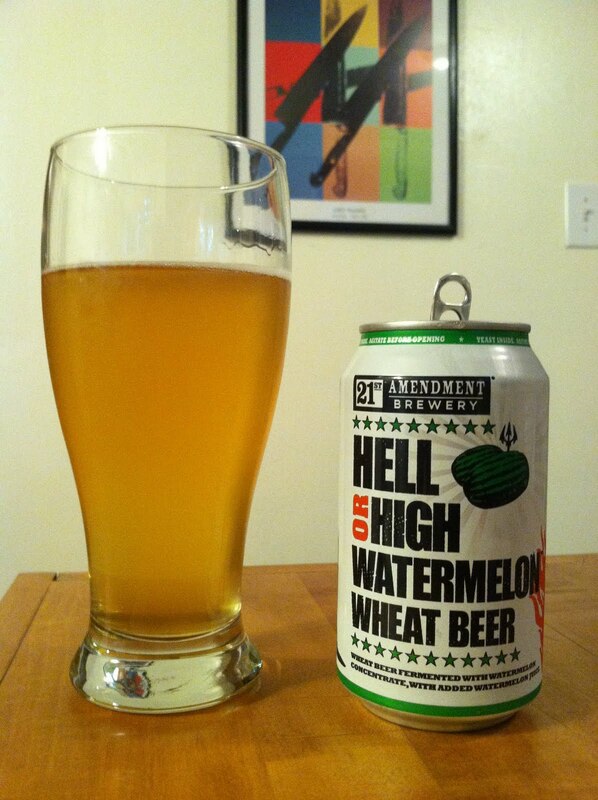 It is brewed in a classic American wheat beer style, and then undergoes a secondary fermentation using fresh watermelon (although the can says concentrate and additional watermelon juice). The end product has a hazy glow like that of any other traditional wheat style beer. The taste is malty and smooth, with a kiss of watermelon flavor at the end that doesn’t stay with you. It rolls down the tongue then vanishes. The watermelon flavor is a bland mimic of a jolly rancher. Just enough to let you know it’s there. Sort of a touched by an angel situation. I personally don’t look for a fruit flavor to linger with me like the hops of an IPA. Just get in, do you job, and get out. The beer comes in a can which first drew my attention at the local bottle shop. One might think, “craft beer in a can?”, I say “don’t be a jabrone, pour it in a glass and drink up”. It’s tasty on steamy summer day for 1 or 2, then switch to something else. Probably a fine accompaniment to fried chicken. Now I have to start doing this, thanks a lot. hah I liked it. I have always wanted to sit in the room when they are coming up with the idea of a watermelon beer.